Basquiat's expressive style was based on raw figures and integrated words and phrases. His work is inspired by a pantheon of luminaries from jazz, boxing, and basketball, with references to arcane history and the politics of street life--so when asked about his subject matter, Basquiat answered "royalty, heroism and the streets." In 1983 he started collaborating with the most famous of art stars, Andy Warhol, and in 1985 was on the cover of The New York Times Magazine. When Basquiat died at the age of 27, he had become one of the most successful artists of his time. This book allows an unprecedented insight into Basquiat's art, with pristine reproductions of his most seminal paintings, drawings, and notebook sketches. 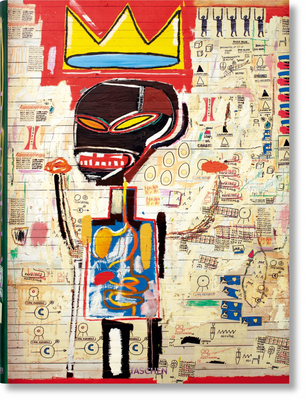 In large-scale format, the book offers vivid proximity to Basquiat's intricate marks and scribbled words, further illuminated by an introduction to the artist from editor Hans Werner Holzwarth, as well as an essay on his themes and artistic development from curator and art historian Eleanor Nairne. Richly illustrated year-by-year chapter breaks follow the artist's life and quote from his own statements and contemporary reviews to provide both personal background and historical context.